What sort of entitlements should citizens have in a just society? 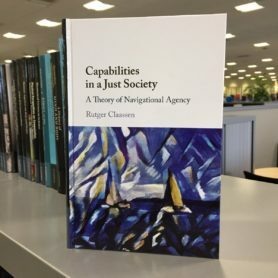 In this book, Rutger Claassen sets out a theory of what he terms ‘navigational agency’, whereby citizens should be able to navigate freely between social practices. This shows how individuals can be at the same time free and autonomous in striving for their own goals in life, but also embedded in social practices in which they have to cooperate with others. He argues that for navigational agency, people need three sets of core capabilities: those which allow human empowerment in civil society, a decent level of socio-economic subsistence, and political participation in democratic decision-making procedures. The idea of navigational agency, the book argues, provides an alternative to currently dominant versions of the capability approach to social justice, and strengthens its liberal foundations. Read before you access: If you have never used GoToMeeting before you will be prompted to download the launcher file, which may take a couple of minutes. During the presentation, attendees will be asked to be in mute mode so as to limit background noise. If you have questions for clarification purpose, please send them to the chair (Morten Fibieger Byskov) via the chat box at the bottom right of the screen. It is advisable to test your connection before the webinar starts by joining a test session to check that your computer has everything required. To test your connection, join the test session via: https://www3.gotomeeting.com/join/406552062.